1 This was the teaching of Ulrich Zwingli (see e.g. pp. 535ff here [page numbers in the right margin]; pp. 243ff here; and pp. 392ff here). 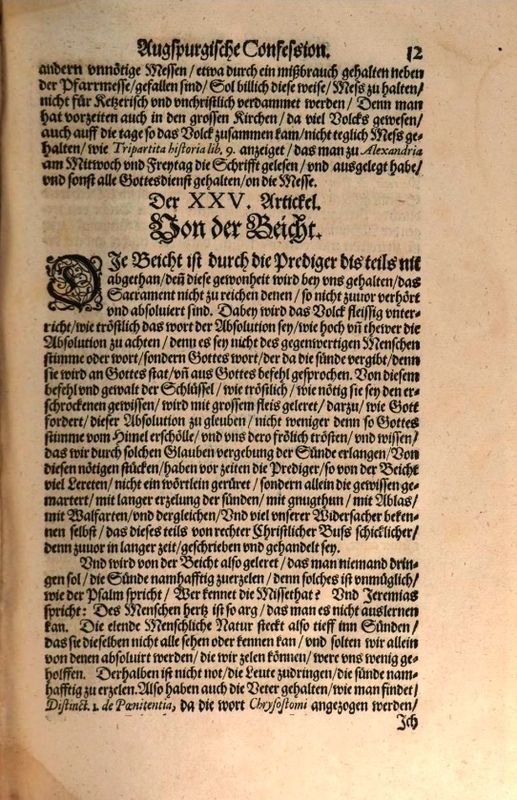 2 An additional sentence in Melanchthon’s so-called editio princeps (first edition) of the Augsburg Confession, published in 1531, shows that here the Lutherans were seeking to distance themselves from scholastic teaching within the Roman Church: “We therefore reject those who teach that the sacraments make a person righteous ex opere operato [by the mere performance of the work] apart from faith, and who do not teach that there also needs to be faith that forgiveness of sins is being offered there, which is obtained through faith, not through the work.” The concept of the sacraments benefitting a person ex opere operato had been promoted since the 13th century. 1 For scriptural proof, see Matthew 26:26-29; Mark 14:22-25; Luke 22:19,20; 1 Corinthians 10:16; 11:23-25,27. See Cyril of Jerusalem’s On the Mysteries for a strong example of corroboration of this teaching on the part of the early Church Fathers. 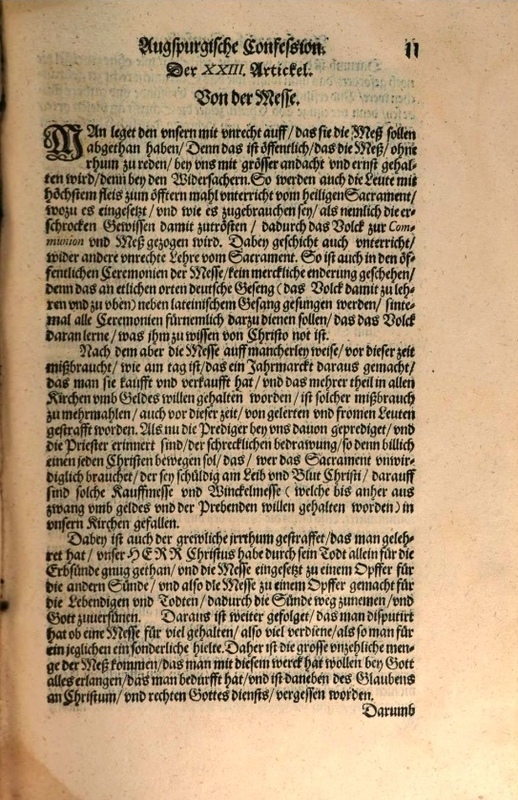 The Latin version reads: “…are distributed to those who eat in the Lord’s Supper.” The point Melanchthon is driving home – at this point in history, at any rate – is that Jesus’ body and blood are truly present in connection with the earthly elements. 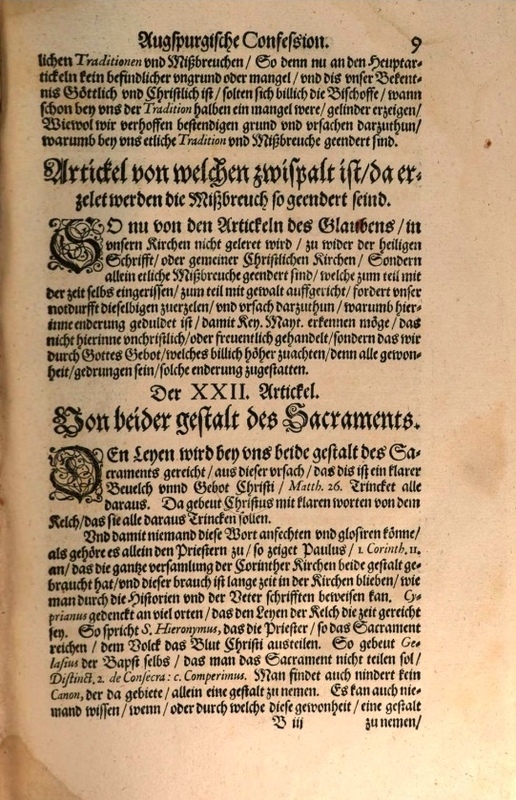 Sometimes the anti-sacramentarians would use the language of “truly present,” but they meant apart from the elements, the so-called “spiritual eating and drinking.” Melanchthon is teaching that whether you are believer or unbeliever, when you step forward to the Lord’s Supper, when it has been consecrated and is being celebrated in accordance with Christ’s institution, you are receiving his actual body and blood when you receive the bread and wine – either to your benefit or to your detriment. 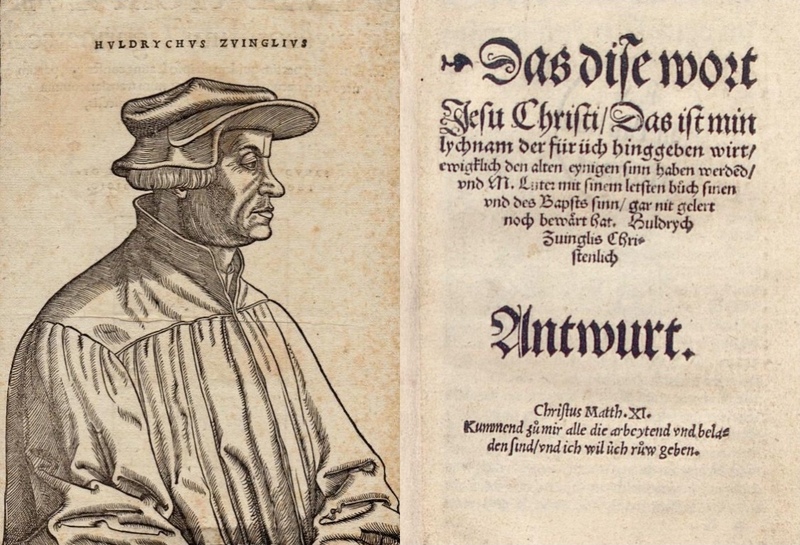 Left: Hans Asper, Huldrychus Zvinglius (Ulrich Zwingli), woodcut, 1531. Right: Ulrich Zwingli (1484-1531) wins the award for longest book title in the Sacramentarian Controversy: That These Words of Jesus Christ, “This Is My Body Which Is Given for You,” Will Forever Retain Their Ancient, Single Meaning, and Martin Luther With His Latest Book Has by No Means Proved or Established His Own and the Pope’s View: Ulrich Zwingli’s Christian Answer (Zurich: Christoffel Froschouer, June 1527). Martin Luther often cited the German proverb, “Wherever God builds a church, the devil builds a chapel nextdoor.” Nowhere was that more noticeably true in Luther’s lifetime than in the Sacramentarian Controversy. The two most public opponents of Luther in the controversy were Ulrich Zwingli, a priest in Zurich, Switzerland, and Johannes Oecolampadius, a professor and preacher in Basel, Switzerland. Both of them at first publicly declared their agreement with Luther’s teachings, including his teaching on the Lord’s Supper. But around 1524 and 1525, they began teaching that Christ was not really present, but only symbolically present in the Supper. 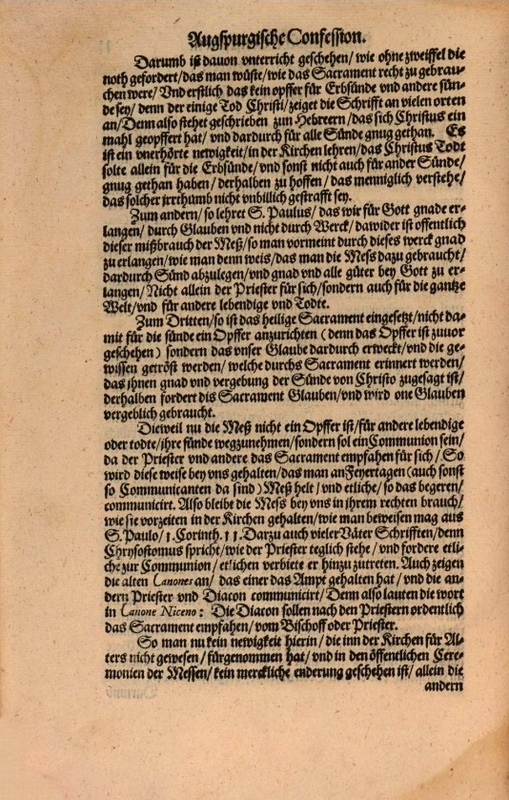 When a literature battle between both sides ensued, Luther continually based his sacramental teaching on the clear words of Jesus and the apostle Paul in passages having to do with the Lord’s Supper, while Zwingli and Oecolampadius based their sacramental teaching on John 6 (where Jesus’ discourse predates his institution of Lord’s Supper and speaks of faith, not the Sacrament) and on human reasoning. The controversy culminated at the Marburg Colloquy on October 1-4, 1529. While the in-person meeting did take the vitriol out of the controversy, it also confirmed that an irreparable rupture had divided the evangelical camp. 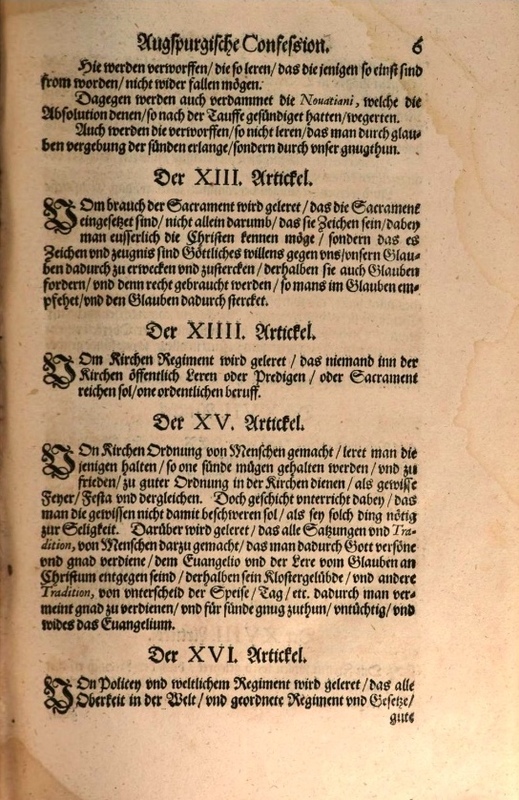 Those present agreed to the first 14 of the so-called Marburg Articles that Luther drew up at the end of the meeting, but the Lutherans and the Zwinglians disagreed on the last point concerning the essence of the Lord’s Supper. As a result Luther said the Zwinglians did not have the same spirit, and Luther and his followers refused to acknowledge them as brothers and members of the body of Christ. And as it turned out, the unity on the other 14 articles was not as strong as it first appeared. 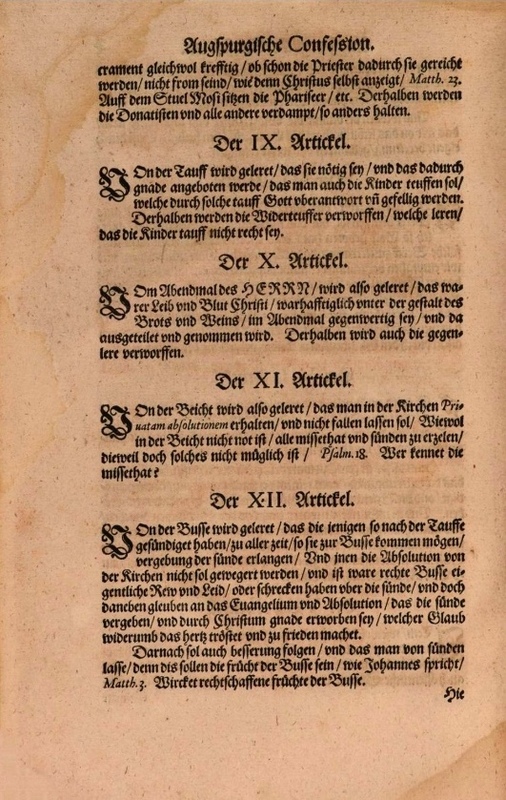 The sixth, eighth, ninth, and fourteenth of the Marburg Articles affirmed God’s word and baptism as means of grace, but in the seventh point of the personal presentation of faith (fidei ratio) that Zwingli drew up for Emperor Charles V the following year, he rejected the concept of any means of grace. The Marburg Colloquy was held in the Royal Castle, pictured here on a hill in the center background. The city of Marburg is viewed from “Der Leynberg” or the Lahnberge, Striped Mountains, in the foreground (east), with St. Elizabeth Church on the right (north) and St. Mary’s Parish Church beneath the castle. The university is to the left (south) of St. Mary’s. 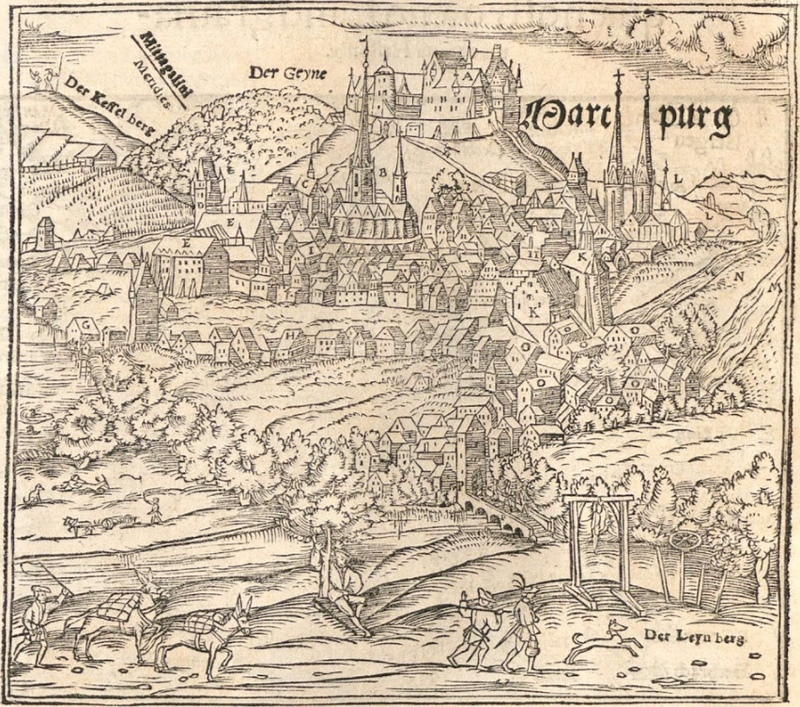 The hill behind the castle to the southwest is identified as “Der Geyne” (in a 1572 woodcut from a different atlas, “Der Geine”), and the hill to the south of that as “Der Kesselberg” or Copper Mountain. The following is taken from A Sermon on the New Testament, that is, on the Holy Mass (1520) by Martin Luther. The work as a whole does not yet represent Luther’s mature thought on the Lord’s Supper, but it does “replace the traditional notion of the mass as a sacrifice with the scriptural teaching of the Lord’s Supper as a testament” (LW 35:77). The very first paragraph is also a masterpiece on the purpose and limitations of the law, and may appear in a subsequent Quote of the Week. In the quote that follows, from paragraph or section 15, Luther helps us to distinguish between taking the Lord’s Supper in a worthy manner (cf. 1 Corinthians 11:27) and taking it as intrinsically worthy people (which we neither can nor do). 1 Luther has this, intentionally or not, in the form of a memorable rhyme: Er wirt dir nit liegen, deyn gedanckenn werden dich triegen.